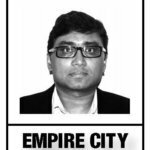 NEW YORK – There is significant presence of Indian subcontinent-origin artists in the exhibition ‘Home Is a Foreign Place: Recent Acquisitions in Context’, opening at the Met Breuer, on April 9, 2019, through June 21, 2010. 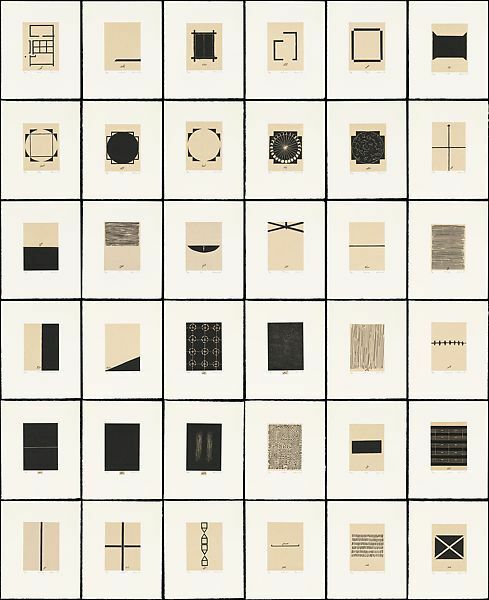 The title itself is taken from the Aligarh-born, Indian American artist Zarina Hashmi’s 1999 suite of 36 woodcuts chine collé with Urdu text printed on paper and mounted on paper. The work explores questions about migration, exile, and the tenuous meaning of ‘home’. Zarina Hashmi’s ‘Home is a Foreign Place’, 1999. Photo courtesy: Met Brueur. The folios in Zarina’s series are visual responses to words in Urdu, that conjure multiple senses of home – from the areas of a physical space, to the experience of weather in a particular space, to the cosmic phenomena that marks the passage of time. The 82-year-old artist, who goes professionally by her first name, and who has lived in New York City since the 1970s, has served in the past as a board member of the New York Feminist Art Institute. Brinda Kumar, Assistant Curator of Modern and Contemporary Art, Met Breuer, speaking at the private opening of the exhibition, today, on April 8, said Zarina, who is associated with the Minimalist movement, created ‘Home is a Foreign Place’ at a tough time in her life, when she faced eviction from her loft in New York City. Zarina’s work is among a diverse group of paintings, sculptures, installations, and videos from around the world made between 1944 and 2016 that explore artistic engagements with language, architecture, space, seriality, politics, and media, in the exhibition. They are juxtaposed with existing icons of American art from the Met’s collection. Zarina’s work is juxtaposed next to Jasper Johns’ painting ‘White Flag’, made in 1955 during the Cold War. He crafted a bleached, erased form that complicates the viewer’s relationship to a highly charged American symbol. “This display foregrounds both new and familiar pieces that address the effects of history on culture, and of our place in the world,” said Max Hollein, Director of the Museum. Works by American luminaries such as Mark Rothko and Adolph Gottlieb are shown alongside their international contemporaries, including Saloua Raouda Choucair and Ibrahim El Salahi. ‘Structure with One Thousand Pieces’, 1966-68, by Saloua Raouda Choucair. Photo courtesy: Met Brueur. 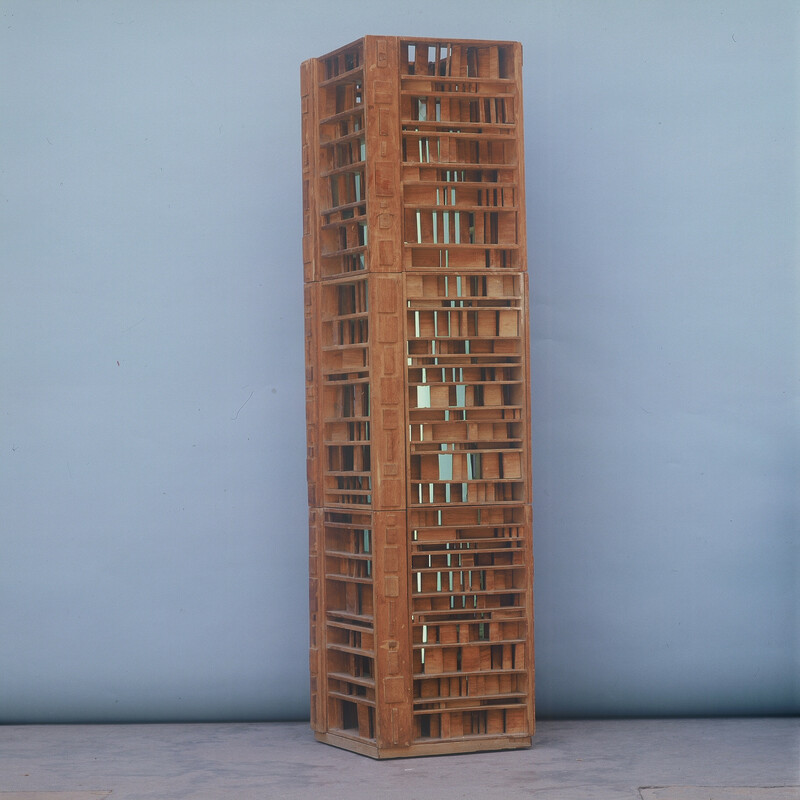 Choucair’s installation ‘Structure with One Thousand Pieces’, which is lit up from inside, is a wonderful piece of work, hauntingly similar to a Manhattan office building, a skyrise that blends seamlessly with the cityscape. Indian artist Prabhavati Meppayil’s work ‘n/eighty nine’, from 2016, addresses the global legacies of modernism. She combines Minimalist abstraction with centuries-old artisanal techniques informed by her family’s long history working as goldsmiths in Bangalore. In the exhibited work, she delicately embedded parallel bands of thin copper wires into the layered gesso surface, which she partially revealed through a careful method of sanding and polishing. As the copper wires oxidize over time, they turn shades of blue and green, enacting a form of visual resistance against the white background. This process demands that viewers encounter the works up close, while subtly indicating a temporal dimension to her method. 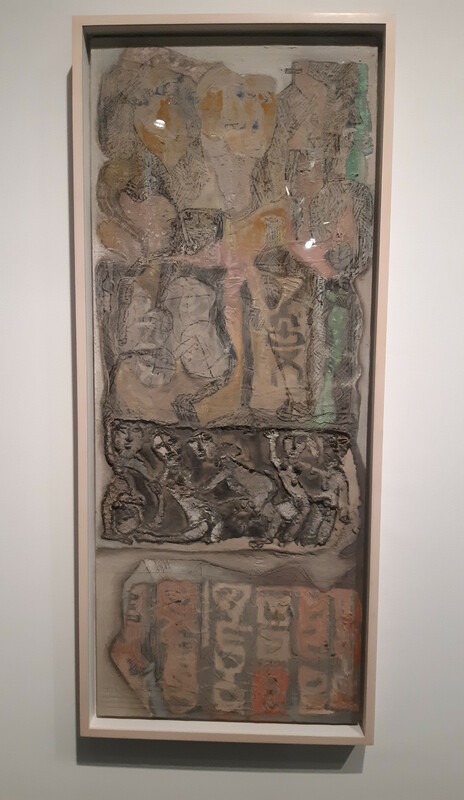 The late Indian artist Mohan Samant’s work ‘Abstract Signs and Temple Frieze’, from 1964, has a multitude of references, including Indian traditions of painting and sculpture, Egyptian hieroglyphs, art of the ancient Americas, and the large-scale abstract works favored by the so-called New York School of artists. 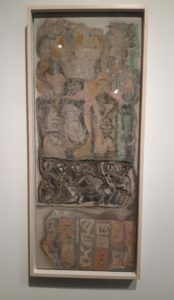 Many of these influences are discernible in this work: from the signs and symbols (possibly derived from glyphs seen in Mexico) arranged in columns – a favored approach Samant shared with his European and American contemporaries, including Jasper Johns – to a band of dancing figures similar to those adorning the sides of temples at Khajuraho. By using plaster and sand to build this object’s highly textural surface, Samant may have been further alluding to architectural friezes. The ravages of war, displacement, and exile, are to be found in several pieces. The Singapore-born, Malaysian artist Simryn Gill, in her series of photographs of abandoned and looted buildings entitled ‘My Own Private Angkor’ (2007- 2009), created a personal archaeology that hauntingly reflects the regional economic and political changes of Malaysia. The Cambodian artist Sopheap Pich’s work, ‘Ratanakiri Valley Drip’, from 2012, constructs a seemingly modernist grid with thin bands of indigenous rattan coated using a mixture of wax, resin, and collected earth samples to suggest the landscape of Ratanakiri, in the country’s northeast province – a once verdant and thriving region now ravaged and stripped of its natural resources. Pich had grown up during the violent and tumultuous era of the Khmer Rouge regime and immigrated to the United States as a teenager, before he again relocated back to Cambodia. There is also the remarkable work ‘Victory in Iraq,’ from 2004, by Thornton Dial, which recalls President George W. Bush’s premature pronouncement of victory –“mission accomplished” – in 2003. With twisted, tangled, and broken forms and an evocative array of scavenged objects – barbed wire, a mannequin head, stuffed animals – Dial’s construction conjures images of a chaotic war zone. Embedded within this web of destruction, two wood poles form an asymmetrical “v,” a reference to the word “victory,” while the work’s large size suggests the enormity of the international conflict and its consequences. 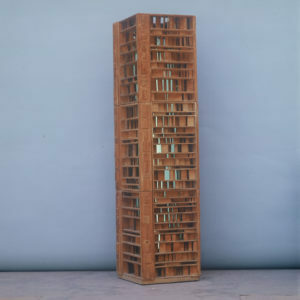 The Karachi-born, London-based artist Rasheed Araeen’s work ‘Chaar Yaar II (Four Friends), from 1968/2010, originally intended the viewer to manipulate and rearrange the four cubes, reflecting his concern with art’s relation to everyday life and his desire to foster dialogue and create community through interaction, according to an accompanying note. Another Pakistani artist living in Britain, Anwar Jalal Shemza’s work, ‘Love Letter I’, from 1969, has the letters ‘B’ and ‘D’ stack and repeat, and in their curved interlacing produce a latticed calligraphic composition. This combination of cultural elements creates a tension that may also parallel Shemza’s own experiences as an expatriate artist. 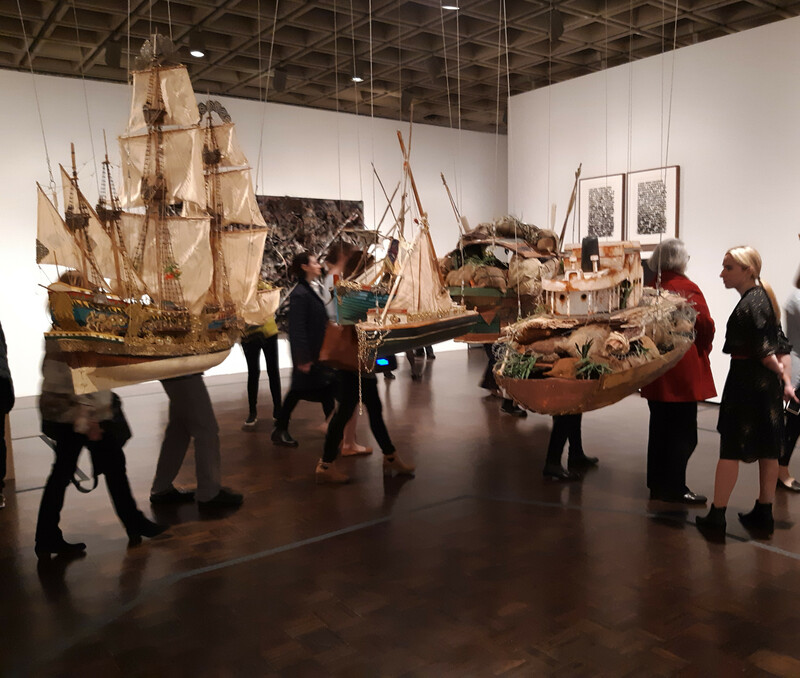 A focal point of the exhibition is British Guyanese artist Hew Locke’s work ‘The Wine Dark Sea, U’, from 2016, which has a flotilla of boats suspended from the ceiling. Hew Locke’s work ‘The Wine Dark Sea, U’. 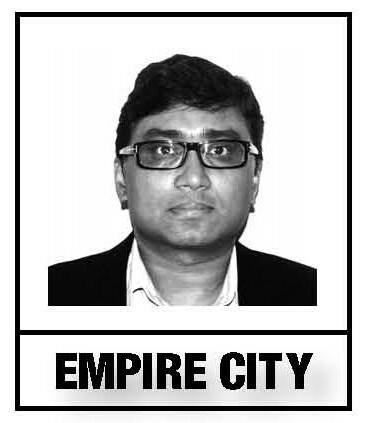 Photo: Sujeet Rajan. The title refers to both Homer’s description of the Mediterranean in ‘The Odyssey’ and Derek Walcott’s representation of the Caribbean in his epic poem ‘Omeros’. Like Walcott, Locke grapples with legacies of entangled histories in the wake of colonialism. 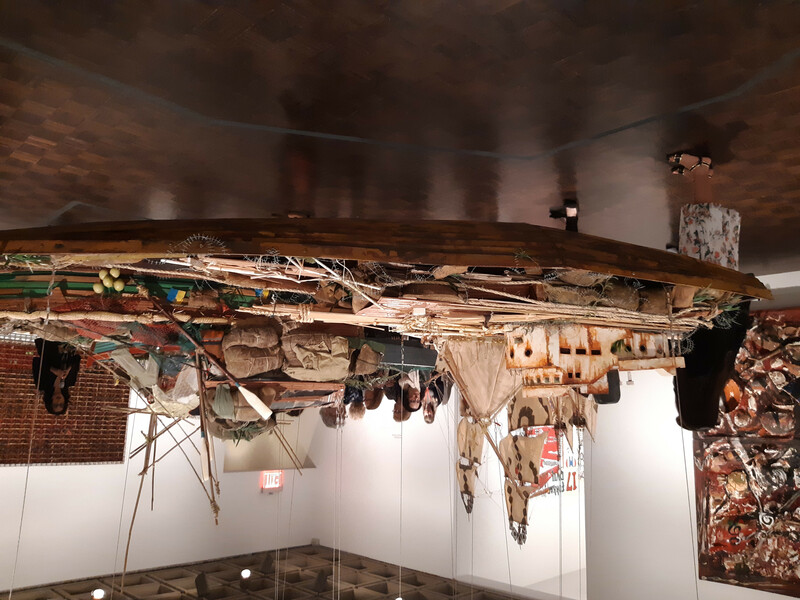 Based on prototypes such as a sailboat, a sixteenth-century galleon, a Cuban refugee boat, and a US Coast Guard ship, the flotilla is a charged symbol for the movement of people across continents and time and is especially resonant in an era when populations continue to confront forced migration and displacement.